This entry was posted in News and tagged anti-government protests, Besiktas, democracy, DISK, pepper spray, Police brutality, social media, Taksim Solidarity Platform, Taksim Square, Turkey, Turkey's main broadcast media, woman in red on 4 June 2013 . 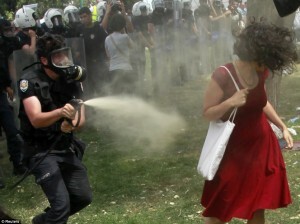 This entry was posted in News and tagged authoritarian, Gezi Park, police crackdown, police’s severity, protest movement, social media, Taksim, Tayyip Erdoğan, tear gas, woman in red on 3 June 2013 . This entry was posted in TV Broadcast and tagged AKP, democracy, Diren Türkiye, social media, Sosyal medya, Tayyip Erdoğan on 3 June 2013 .